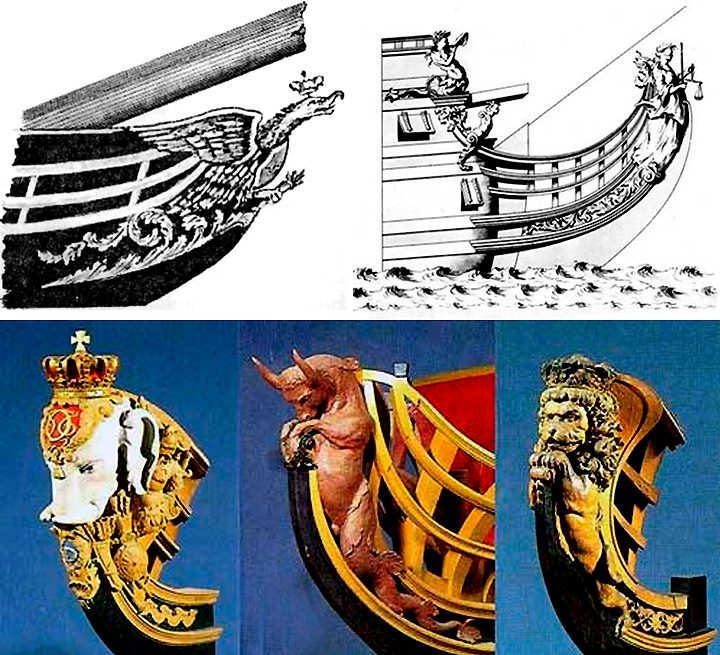 The elaborate decorative wooden carvings known as figureheads were found on the prow of ships built between the sixteenth and nineteenth centuries. Many depicted human females or animals, but other designs could be found as well. There had been ornamentation on boats and ships in earlier eras, in Egypt for example, plus in other cultures of the ancient world. 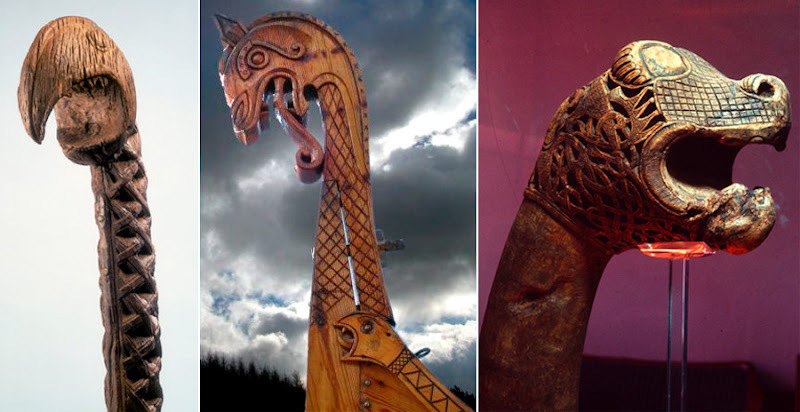 A few centuries later, Viking ships often displayed fearsome dragon’s heads on their voyages between around 800 and 1000 AD (middle and right images above). However, the general practice of using a figurehead arrived with the development of the ocean going galleons of the 1500’s. 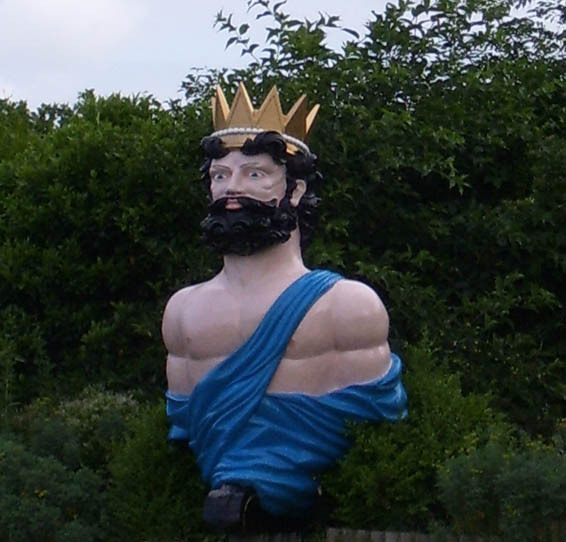 Similar to the manner in which pub signs (which we examined in a couple of previous articles here on Dark Roasted Blend) were employed to advertise premises when the majority of the population couldn’t read, ship figureheads were often used to indicate the name of a ship in a much less literate society. They also could serve to display the wealth and social status of the ship’s owner or the might and power of the country, in the case of military vessels. Not just an ornament - a guide to the afterlife! 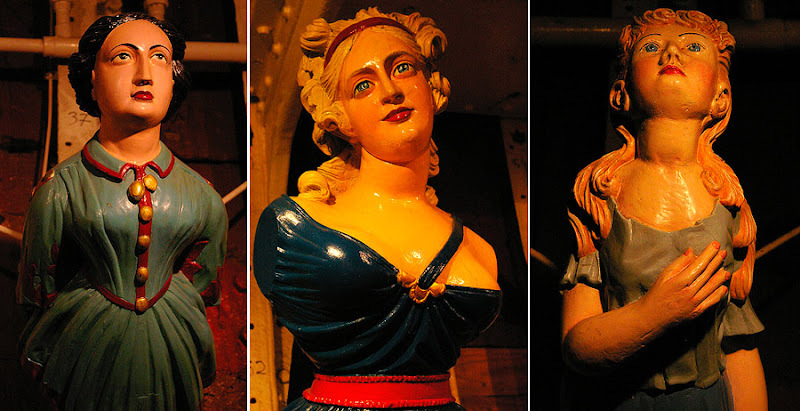 Figureheads also served as a kind of good luck charm for the ship’s crew. 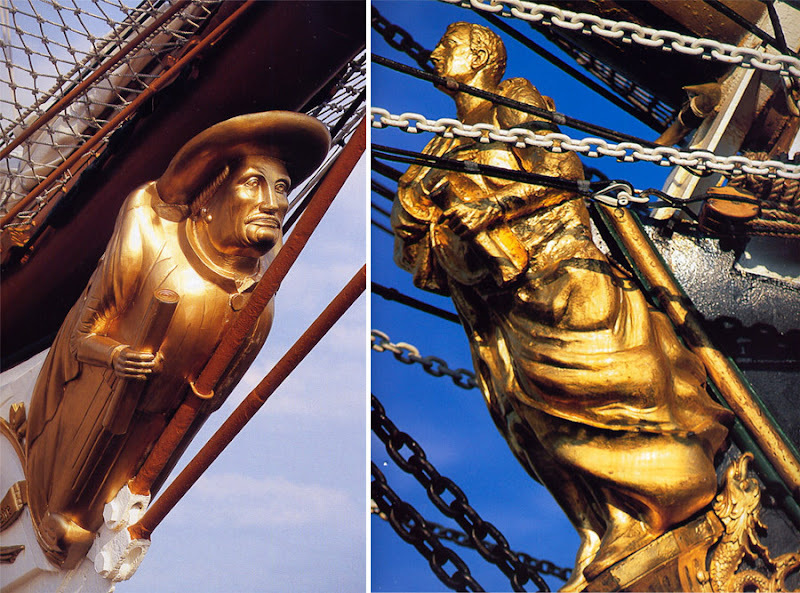 In Germany, Belgium and Holland, it was believed that the ship’s figureheads contained spirits called Kaboutermannekes. These spirits protected the ship and crew from fierce storms, treacherous winds, uncharted rocks, illness or disease, and in the event the ship sank, the spirits would guide the sailors souls to the afterlife. If sailors lost their lives at sea without such protection, it was believed their souls would haunt the sea for all eternity. 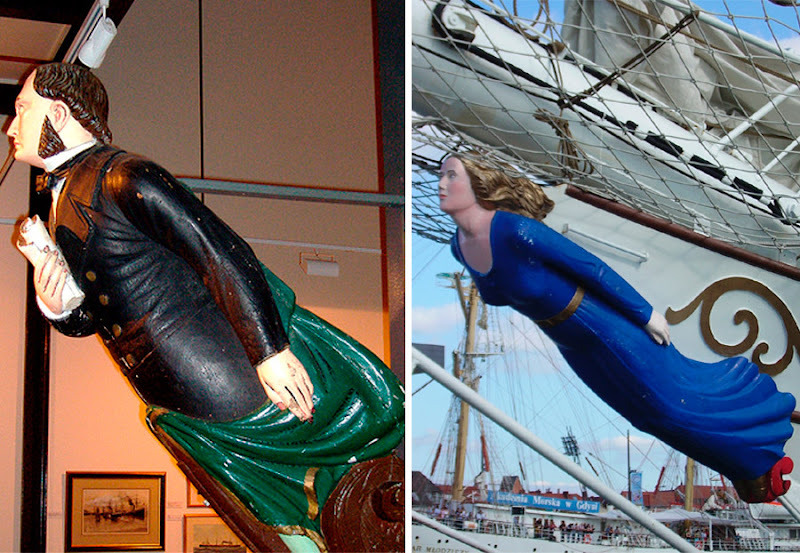 Figureheads became somewhat popular again following the Napoleonic Wars, after having almost disappeared entirely by 1800, but were smaller that the full figure versions that had been popular in previous centuries. 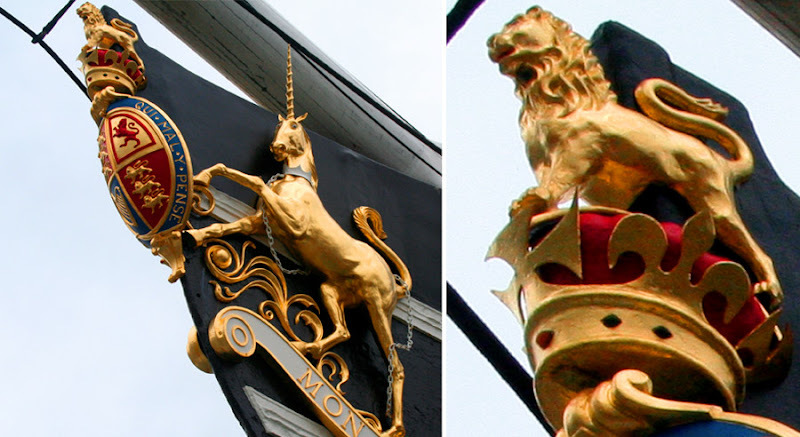 Here’s the bow of Nelson’s flagship, HMS Victory, from the early nineteenth century (left). 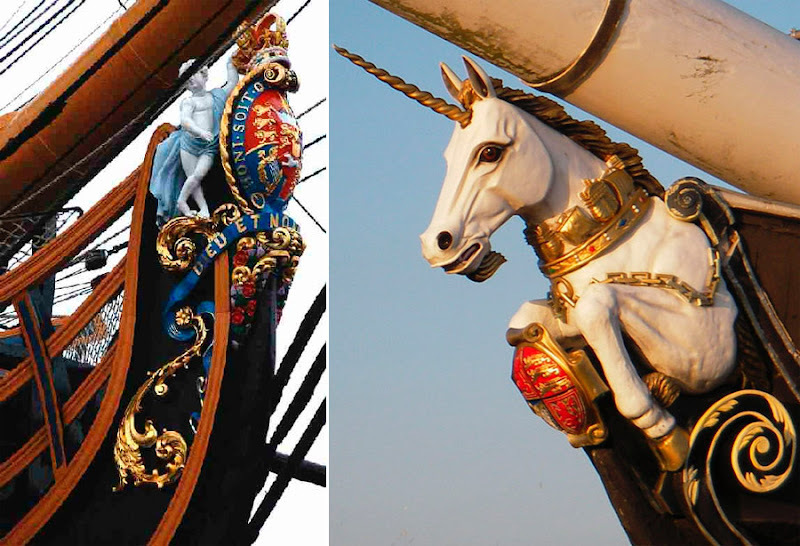 The British frigate Unicorn was launched in 1824 with the striking decoration (shown above right). A Tea for Two and a Rub for my Figurehead! 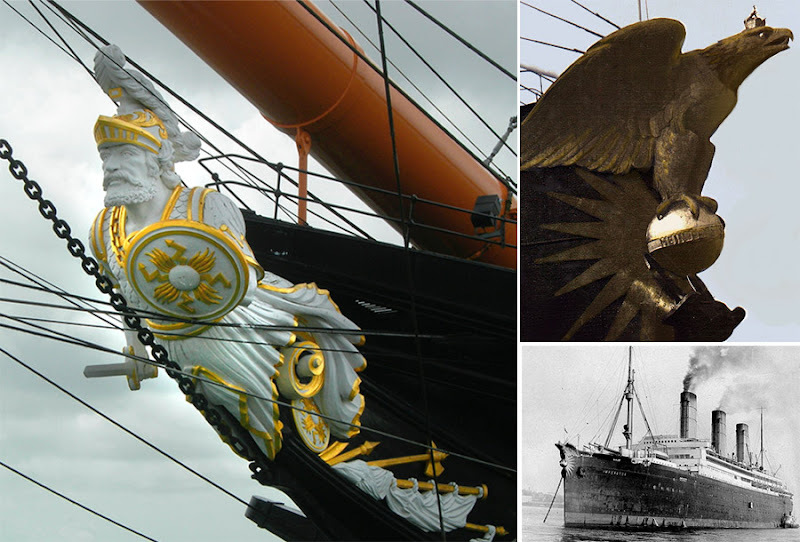 The first steamships sometimes had decorations on their bows, but figureheads mostly died out with the demise of the sailing ship. 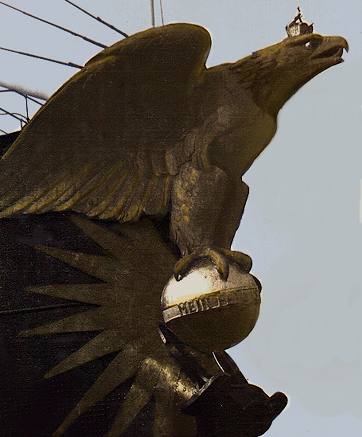 The German ocean liner Imperator, launched in 1912, used a large bronze eagle as a figurehead (see above image on the right). The extra feet of length it provided made Imperator the longest ship in the world at the time, beating the British ship Olympic, a sister vessel of the Titanic. Here’s a sight familiar to residents of, and visitors to, the Canadian city of Vancouver. This carving of a sea dragon, located in Stanley Park, is a replica of the figurehead of the Empress of Japan, which sailed back and forth from Canada’s west coast to Asia from the early 1890’s until 1922. 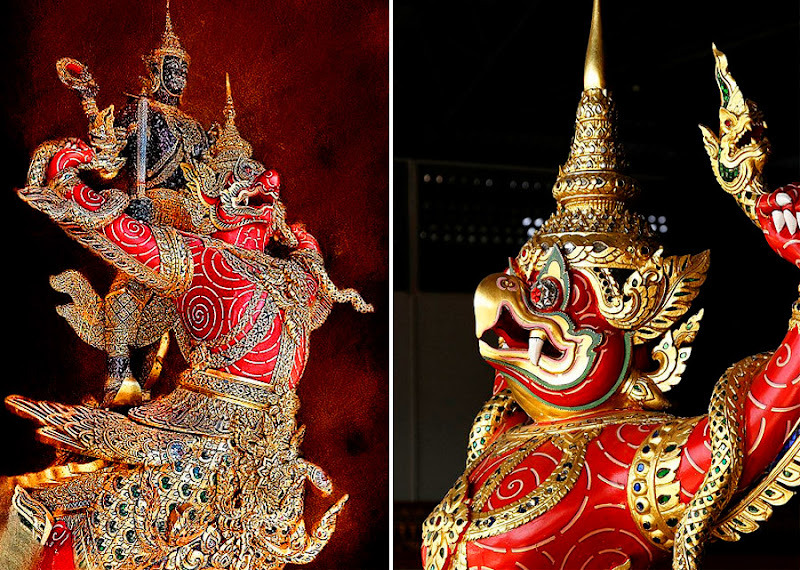 And speaking of Asia, here are some examples of figureheads from Thailand, displayed on barges used by the royal family. This first one dates from the mid-sixteenth century. 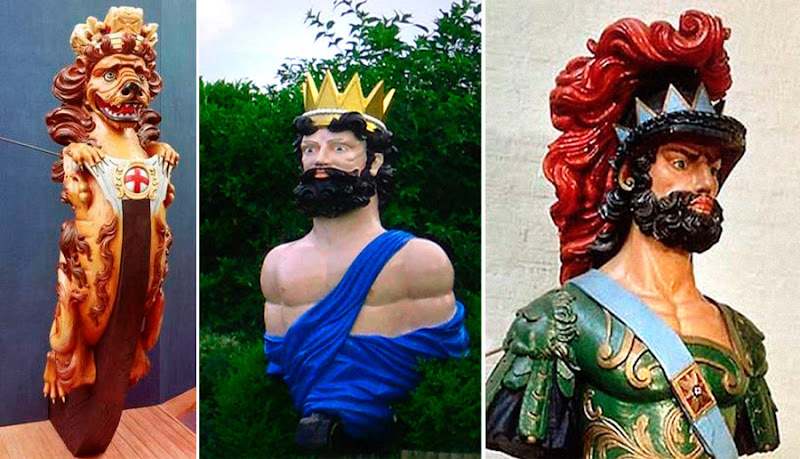 Today, the examples of elaborately decorated figureheads found in museums, historic collections and other locations around the world remain a fascinating reminder of a bygone age. We hope you’ve enjoyed this look at figureheads here at Dark Roasted Blend. 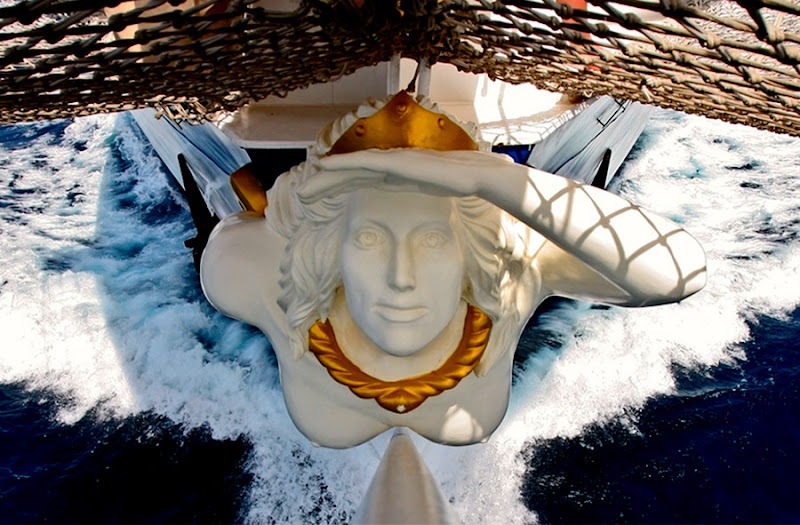 This is another interesting figurehead of Thailand's barge. First pic is not the "Cutty Sark"; the bare-breasted lady reaching out to grab Tam o'Shanter's horse's tail (from the poem by Robert Burns), about a third of the way down the page, is the actual "Cutty Sark" figurehead. The ship, last survivor of the old tea clippers is permanently drydocked at Greenwich, England. She was almost destroyed by a fire in 2007, but has been restored.